Finding the right ceiling fan for an area of your home can seem daunting, especially when you start to compare prices, designs, styles, finishes and more! So how do you know what type of ceiling fan will best fit your personal taste, and also add an elegant flair to your home? Well, in today’s blog post, our team at M&M Lighting in Houston is here to help. 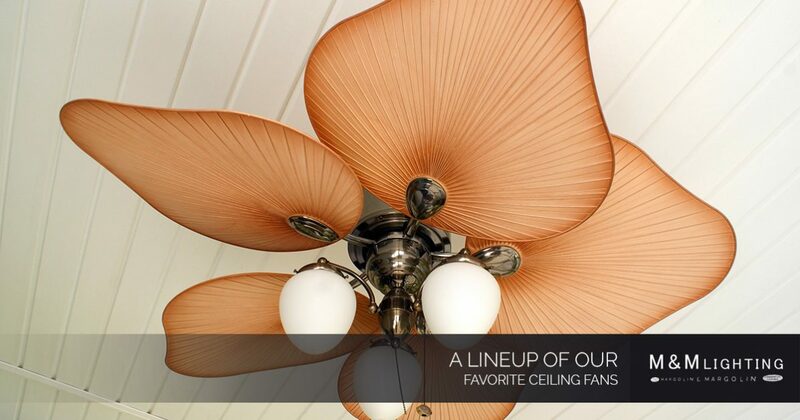 We’ll explain the variety of ceiling fans we offer, and what each style and design is best used for. If you need some help finding the right ceiling fan for your home or office, contact M&M Lighting today! After all, we’ve been a top distributor for lighting fixtures and ceiling fans in the great Houston area for more than 50 years. Hugger fans, also known as flush mount ceiling fans, are secured tightly against the ceiling, as opposed to traditional ceiling fans, which hang from a downrod. Huggers are a sufficient cooling option when the room you’re wanting to place a ceiling fan in is not very big. The National Electric Code requires that fans hang at least 7 feet above the floor, so if your ceiling is particularly low, a hugger fan is the best option for you. Huggers range in finishes, styles and sizes, and they can be customized with lighting options or can be installed outdoors. These types of ceiling fans are usually placed in an outdoor seating area, patio, porch or balcony. They differ in that wet fans can be installed anywhere and can be exposed to direct rainfall, whereas damp fans can only be installed in dry locations or damp covered areas. Do NOT try to install an indoor fan outdoors — look into one of these two options! Traditional fans are your everyday fans that you see most commonly. They can be ornamented with lights and designs, which add a sense of formality and unique style. Contemporary or modern ceiling fans have a sleek and sophisticated style with minimalist lines and ornamentation. They offer unique styles and finishes that match best if your home has a modern-theme. Small, medium and large fans! OK, you caught us: We’re a fan of all fans! (pun intended) If you’re unsure of the size fan you should pursue, check out our breakdown below. Small fans are ideal for smaller spaces you’re needing to spruce up, whether that’s a tiny entryway, bathroom or closet. They are anywhere from 25 to 36 inches, on average. Medium ceiling fans are best for rooms that aren’t small but aren’t huge, as these fans are typically anywhere between 37 and 58 inches. Think a kids’ bedroom or small office area. Large ceiling fans are best suited for the larger rooms in your home, such as the master bedroom, living room, dining room or kitchen. These fans range from 59 inches in length and up! Our team of expert lighting specialists at M&M Lighting know everything there is to know about lighting, from functionality to design. Our professionals can connect you with your ideal ceiling fan, and we’re proud to say we’ve been a top distributor of lighting fixtures and ceiling fans in the greater Houston area for more than 50 years. For more information, call us at (713) 469-3002 or come stop by our Houston showroom today!